Everything futuristic, like new types of products and new types of cars, is trending throughout the world. This trend includes a new food item — insects. Cookies and pasta made from insects have been gaining popularity in Seoul through a restaurant called Papillon's Kitchen, which was opened by Kim Young-wook, CEO of KEIL Co. and Korean Edible Insect Laboratory. As more consumers embrace insects as food, it is expanding into snack shop for pets and cafe for humans. Television shows such as "Law of the Jungle," a Korean reality program where celebrities at times end up having to eat insects while they stay on remote islands, are pushing the trend. But come to think of it, in the past, Koreans have enjoyed insects in their food, although not recently. People who grew up in the 1970s remember eating boiled "Wolnam beolle" or "Vietnam beetle" or grilled grasshopper. Boiled silkworm pupae are still found in restaurants or kiosks, and are believed to be healthy food. Food makers throughout the nation are experimenting with how to incorporate insects into popular Korean dishes. One is Global Food, based in Okcheon, North Chungcheong Province. 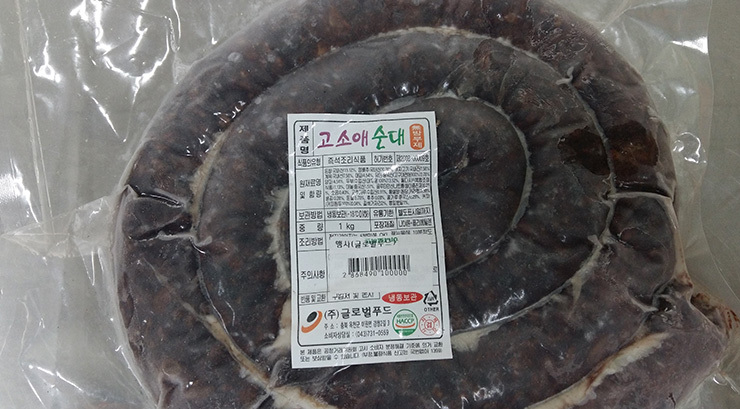 Park Nam-gyu of Global Food has succeeded in making the Korean sausage, "sundae," with powdered insects. He made them using mealworms ground into powder popularly known as "gosodae." "I thought about enhancing the health of our consumers, and the idea was that I would use the mealworm ground powder instead of pork oil so that it would have a higher content of unsaturated fats as well as protein," Park told The Korea Times. At his restaurant Dongacheon near the Cheongju interchange in North Chungcheong Province, he is already serving his specialty, "gosoae" sundae. The sector has been dubbing any food items that use mealworms to be prefixed with "gosoae," such as "gosoae" sundae or "gosoae" cookies, so that it sounds a lot like the Korean word "gosohae," which means nutty. Powdered mealworms when added to dishes usually have a nutty taste. "I think this will be a Blue Ocean in food," Park said, referring to the phrase that implies an item or market with high prospects in the future. On the menu is another specialty Korean pork dish he makes using mulberry leaves. The "mulberry leaves" sundae-soup rice is priced at 6,000 won while the new gosoae is priced at 8,000 won. Park has worked with Cheongju City's Agricultural Technology Center to earn a patent for his gosoae sundae. One employee at the center who has eaten the sundae many times says it tastes just like regular varieties sold at kiosks and restaurants. Currently he outsources the mealworms from other parts of the country, but he also raises them on his small farm for more research and development. He said that he grows them in a 64x30 large tray using bran, organic vegetables and some fruit. The mealworms need about four months to grow before they can be processed into powder. Because their form is not inspiringly beautiful, they are used in powder form in food. "I am currently working on a lot of ideas to utilize them for other food items," he said, as more modern Koreans suffer from diabetes and other lifestyle diseases. "But I am finding out more and more that these insects must be grown and managed cleanly, to become a quality food source," Park said. A company called Chorok Maru has said that it developed the gosoae honey butter cookie. "We focused on controlling the greasy aspect of gosoae powder in this cookie made from brown rice and honey butter flavor," Jeong Jong-wha, a researcher at the company said. As a result, the cookie contains only 5 percent of the gosoae powder, and is expected to hit the shelves late May or early June. "I suspect people will embrace this cookie. While regular cookies taste good, this gosoae honey butter cookie will taste good and be healthy," he said. The trend is happening worldwide. The Food and Agriculture Organization of the United Nations has endorsed edible insects, saying in its 2013 report that these are "high in protein, good fats, calcium, iron and zinc." It also said that using insects as food can help "increase dietary quality as sources of protein." Edible insects are also known as environmentally friendly. The government has focused on this industry for growth, forecasting it to grow to 530 billion won by 2020. It has now specified seven insects including mealworms, grasshoppers or Oxya japonica Thungberg, silkworm pupae and crickets as food sources.